The 1.3-mile expressway, which was built in 1962, cut off residents’ access to the Bronx River and created both traffic congestion and air pollution in the area. While plans have been proposed and languished for decades, we're taking action to finally right the wrongs of the past by reconnecting South Bronx communities that have dealt with unnecessary barriers to revitalization and growth. The project will create an interconnected South Bronx with access to the Waterfront, recreation, and less traffic on local streets while simultaneously better supporting those who use the Hunts Point Market—a vital economic engine for the borough. This announcement comes several months after Governor Cuomo dedicated $15 million to the development of the Greenmarket Regional Food Hub in Hunts Point. This extensive infrastructure proposal will be executed in phases, the first to be funded up to $700 million, and will purportedly create 4,250 new jobs over the duration of the project. 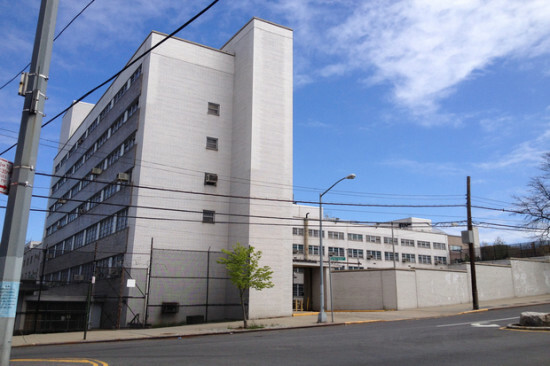 It also comes on the heels of the Governor's $1.8 billion plan to revitalize Central Brooklyn. In early April, the ten finalists in the Rebuild By Design competition unveiled their proposals to protect the Tri-state region from the next Sandy. And in the near future, a jury will select a winner—or winners—to receive federal funding to pursue their plans. But before that final announcement is made, AN is taking a closer look at each of the final ten proposals. 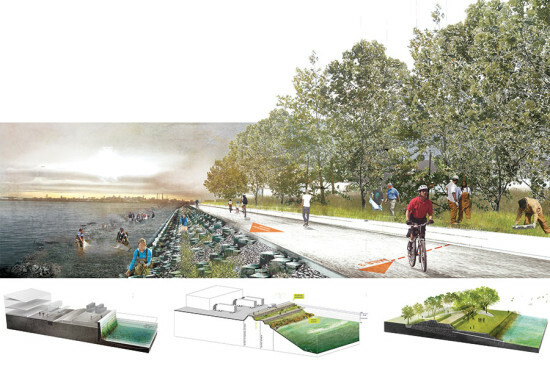 Here’s Penn Design and OLIN's plan for the South Bronx. Penn Design and OLIN propose the "Hunts Point Lifelines" plan to increase resiliency and boost economic activity in the country's poorest congressional district. Their plan focuses on the South Bronx's Hunts Point, a regional hub for food distribution critical to keeping New York City running. The plan includes four key strategies: flood protection, job training and opportunities, cleanways, and planning to maintain food supply chains during emergencies. New infrastructure projects are designed to provide new jobs while greenways, piers, and landscaping would improve access to the water. "Despite severe environmental and economic hardship, Hunts Point also has significant capacity for demonstrating local, community-driven resilience building," explained the team. "An investment in resilience at Hunts Point will be felt throughout the region, providing food security during crisis and serving as a model for working waterfronts located in floodplains everywhere." The team includes HR&A Advisors, eDesign Dynamics, Level Infrastructure, Barretto Bay Strategies, McLaren Engineering Group, Philip Habib & Associates, and Buro Happold. The New York City Economic Development Corporation sent out an RFP for a forward thinking urban farmer to run a 200,000 square foot rooftop farm atop one of the city's major food distribution centers at 600 Food Center Drive in the Hunts Point section of the Bronx. Talk about cutting out the middleman. Once harvested the veggies merely have to make the trip downstairs and down the street for distribution at the City's 329-acre Food Distribution Center. The Bronx would be joining the ranks of Bright Farms with its plans for 100,000 square feet in Sunset Park, Brooklyn. 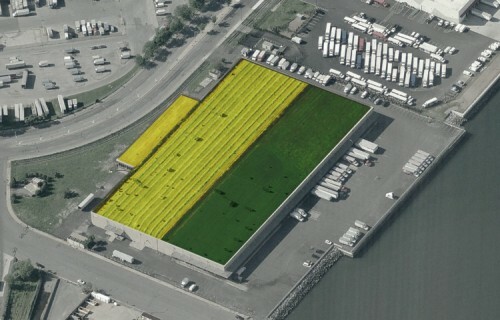 Brooklyn Grange is planning 45,000 square feet in the Brooklyn Navy Yard, and Gotham Greens has plans for expansion. With the newly passed Zone Green allowing for rooftop greenhouses for food production, the venture will no longer will need to clear arduous zoning hurdles should they choose to grow year round. The zoning also requires that the greenhouses capture rainwater, lightening the load on overtaxed sewers. The locale at the distribution point will also cut down on idle truck traffic and shipping costs. "With the potential construction of a new rooftop farm, the Hunts Point industrial area will be able to better provide greater quantities of produce to consumers while generating new employment opportunities for New Yorkers," Council Speaker and likely mayoral candidate Christine Quinn said in a statement. If NYCEDC finds a taker, the Bronx could become home to one of the largest rooftop farms on the planet.